After teasing its lineup of home theater PCs at CES 2015, Origin has launched its new Omega series. Starting at $999 the Omega series consists of five different models with different cases and configurations. The base model is built on a H97 chipset mini-ITX motherboard and comes packing a 4.5GHz Intel Pentium processor and Nvidia GeForce GTX 960. Onboard there's also a 500GB hard disk drive and 8GB of RAM. It might not sound like the most tantalizing list of parts, but even the lowest spec Origin HTPC should give the Xbox One and PS4 some stiff competition. Users will can also configure a high-end system to rival the most extreme of gaming PCs with up to three Nvidia GeForce GTX 980 setup in triple SLI. Origin's Omega machines come running Windows 8.1, but the boutique gaming PC maker says it will support Windows 10 for its upcoming release and Steam OS when it eventually launches. Gamers will also have the option of booting their Origin Omega into Steam Big Picture Mode for immediate access to their game library. Origin has also installed "Mouse Emulation Software" on its systems, which will let you use your Xbox 360 controller act as both a mouse and keyboard. The added flexibility is important as Origin is positioning its Omega line to be more than a console for games. The home theater PC for the living room will also have access to more applications like Netflix and Skype. 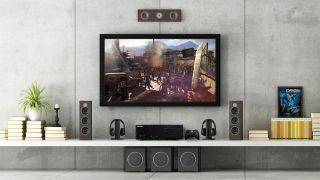 "Omega is our first Home Theater PC that is designed to be the ultimate form of entertainment with the full power, upgradability, and flexibility of a PC for your living room," Kevin Wasielewski, ORIGIN PC CEO and co-founder, said in a release.